This is a heterogenous group of lymphoproliferative disorders characterized by localization of neoplastic T- cells to the skin. An integrated approach including clinical, morphological, immunophenotypic and molecular studies is necessary for classification of these conditions. 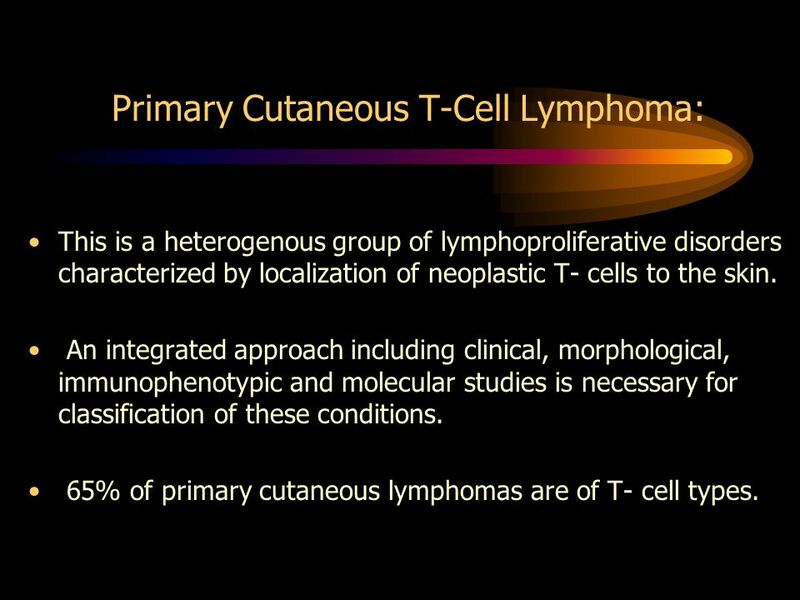 65% of primary cutaneous lymphomas are of T- cell types. 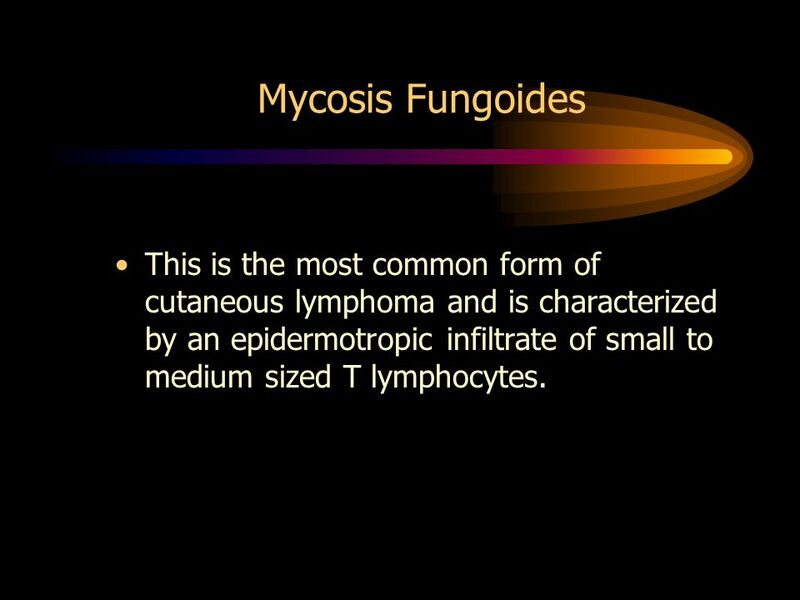 4 Mycosis Fungoides This is the most common form of cutaneous lymphoma and is characterized by an epidermotropic infiltrate of small to medium sized T lymphocytes. Occurs in mid and late adult life. 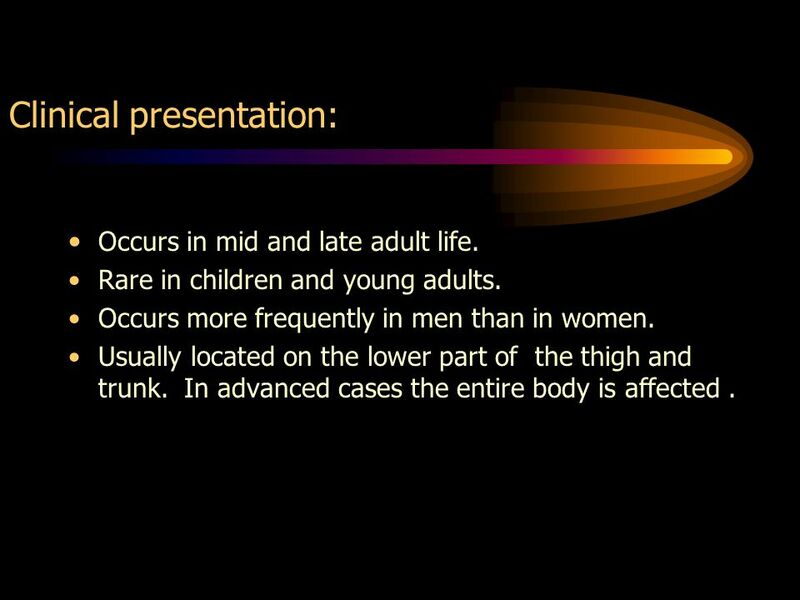 Rare in children and young adults. Occurs more frequently in men than in women. Usually located on the lower part of the thigh and trunk. In advanced cases the entire body is affected . Patch stage: Ill defined , show fine scaling , random in distribution. May persist for may years before progression. 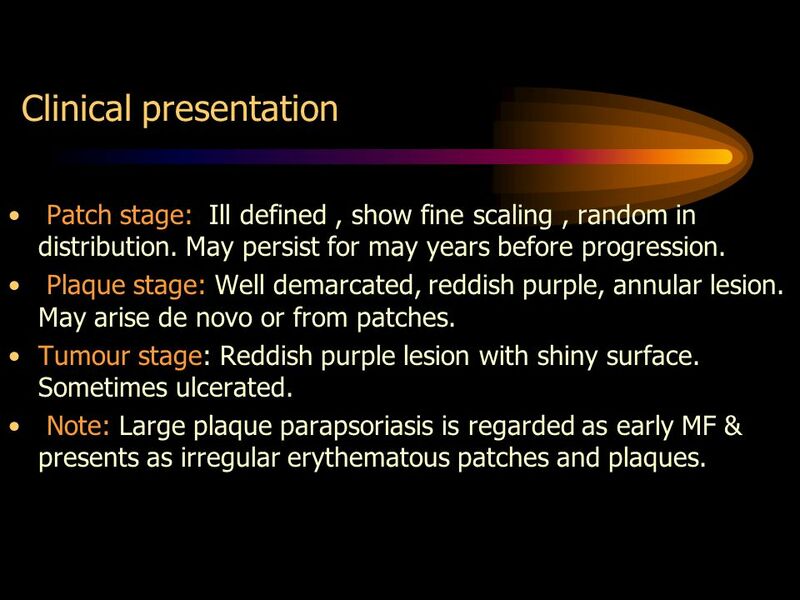 Plaque stage: Well demarcated, reddish purple, annular lesion. May arise de novo or from patches. Tumour stage: Reddish purple lesion with shiny surface. Sometimes ulcerated. Note: Large plaque parapsoriasis is regarded as early MF & presents as irregular erythematous patches and plaques. Patch stage : Sparce infiltrate of lymphocytes in the papillary dermis. Lymphocytes are present along basal layer as single cell in ‘string of beads’ arrangement or as small nests of cells. Clear perinuclear halo is present around lymphocytes. Pautrier’s microabscess is uncommon in patch stage. Plaque stage: More dense infiltrate and more number of pleomophic lymphoid cells with convoluted nuclei. 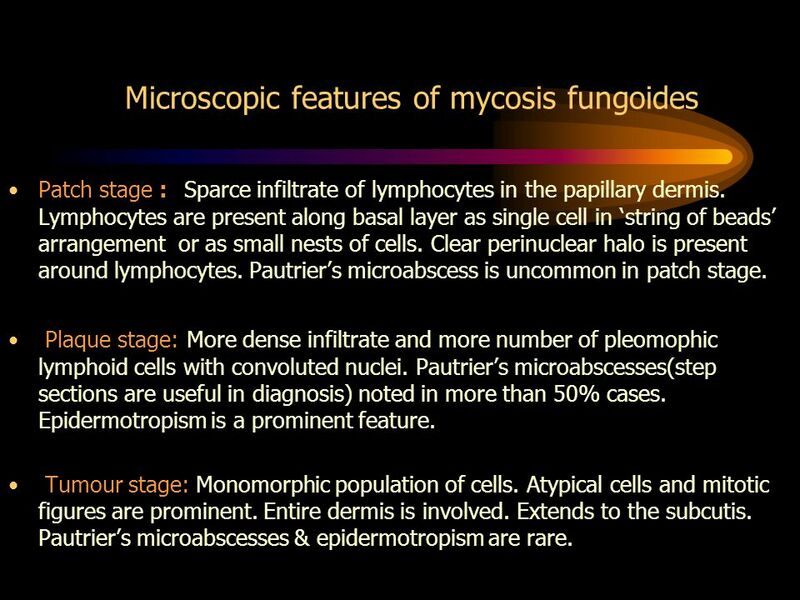 Pautrier’s microabscesses(step sections are useful in diagnosis) noted in more than 50% cases. Epidermotropism is a prominent feature. Tumour stage: Monomorphic population of cells. Atypical cells and mitotic figures are prominent. Entire dermis is involved. Extends to the subcutis. Pautrier’s microabscesses & epidermotropism are rare. Site: Usually on the distal limbs Clinical presentation: Hyperkeratotic patch or plaque. Not present in extracutaneous sites. Microscopic features: Epidermal hyperplasia. 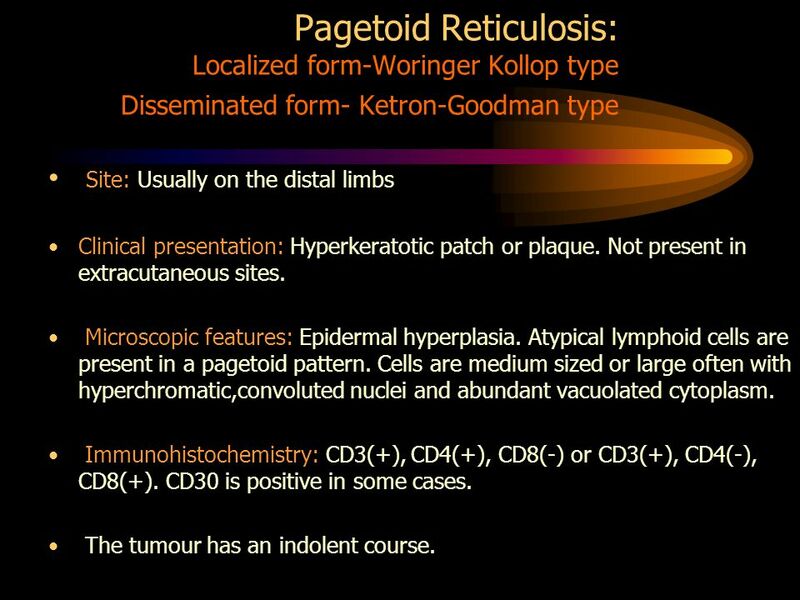 Atypical lymphoid cells are present in a pagetoid pattern. Cells are medium sized or large often with hyperchromatic,convoluted nuclei and abundant vacuolated cytoplasm. Immunohistochemistry: CD3(+), CD4(+), CD8(-) or CD3(+), CD4(-), CD8(+). CD30 is positive in some cases. The tumour has an indolent course. Site: Axilla and inguinal regions Clinical features: Circumscribed zones of pendulous skin. Occurs more commonly in males.One third of cases are associated with Hodgkin’s disease and mycosis fungoides. Microscopic features: Diffuse granulomatous infiltrate with pleomorphic T-cells and multinucleated giant cells. Immunohistochemistry: CD3(+), CD4(+), CD8(-) Most cases have an indolent course. Clinical presentation: Usually in adults. Solitary or localized nodules or tumours. Spontaneous regression in some cases. Regional lymph nodes may be involved. Prognosis is usually favourable. Microscopic features: Diffuse non epidermotropic infiltrates. Cells are mostly pleomorphic with abundant cytoplasm, round to oval nuclei and prominent nucleoli. Reactive lymphocytes, eosinophils and neutrophils may be present. Immunohistochemistry: CD30(+) in more than 75% cells. CD4(+)T cells . CD2 , CD3 & CD5 are negative. Less than 5% CD8(+). EMA and CD15 negative in most cases. 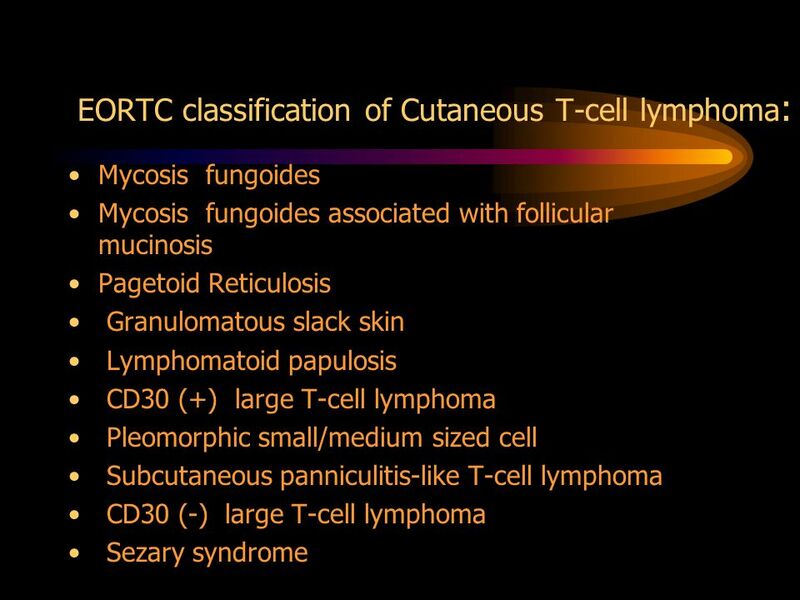 Note: CD30(+)large T-cell lymphoma developing from mycosis fungoides has a poor prognosis. Clinical presentation: Single or multiple plaques or tumours. Patch stage is not present. 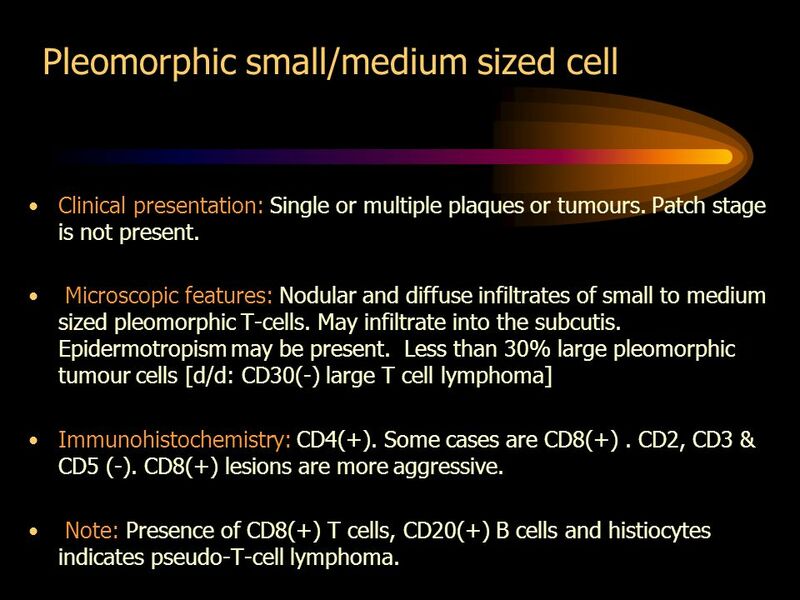 Microscopic features: Nodular and diffuse infiltrates of small to medium sized pleomorphic T-cells. May infiltrate into the subcutis. Epidermotropism may be present. Less than 30% large pleomorphic tumour cells [d/d: CD30(-) large T cell lymphoma] Immunohistochemistry: CD4(+). 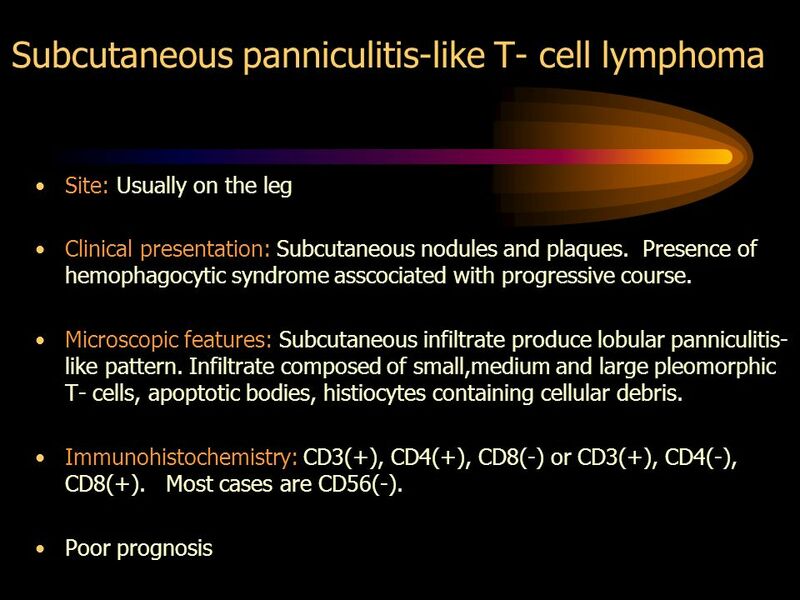 Some cases are CD8(+) . CD2, CD3 & CD5 (-). 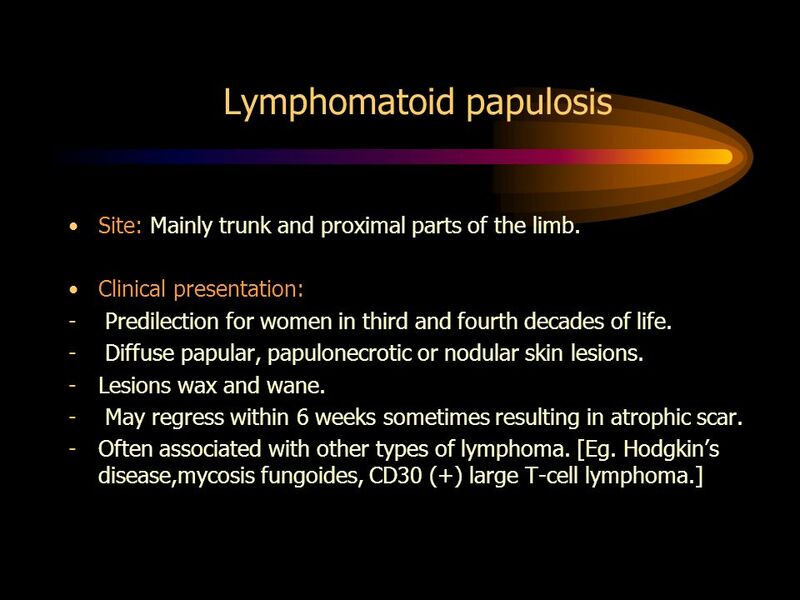 CD8(+) lesions are more aggressive. 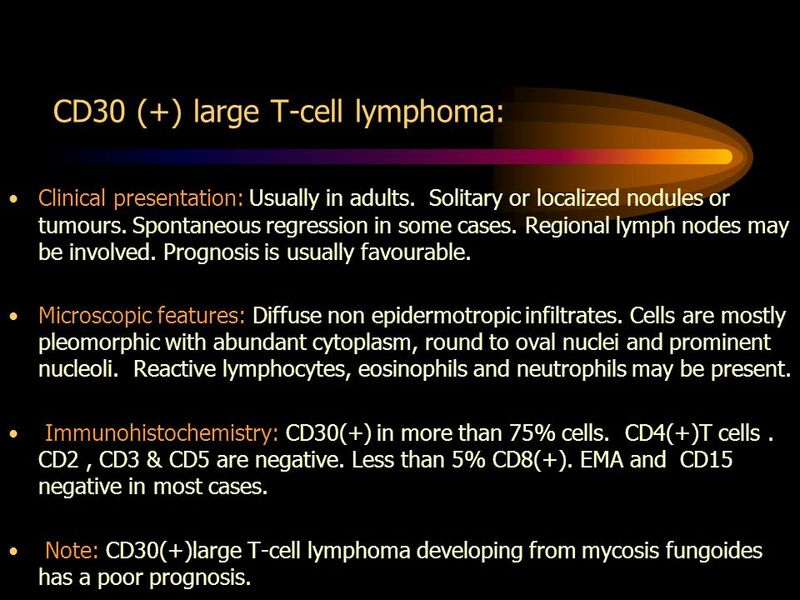 Note: Presence of CD8(+) T cells, CD20(+) B cells and histiocytes indicates pseudo-T-cell lymphoma. 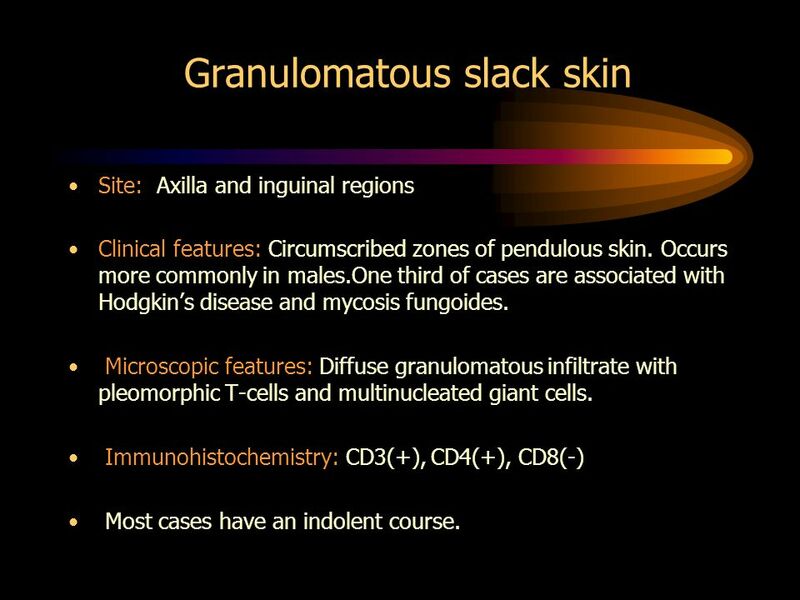 Clinical presentation: Solitary, localized or generalized plaques, nodules or tumours. Aggressive course. Microscopic features: Nodular or diffuse infiltrate of medium sized to large pleomorphic T-cells with convoluted nuclei and immunoblasts (atleast 30% of total tumour cell population). Epidermotropism and angiocentric pattern may be present. Immunohistochemistry: CD4(+) T-cells. CD2,CD3,CD5(-). CD30 usually negative (scattered positive cells in some cases). 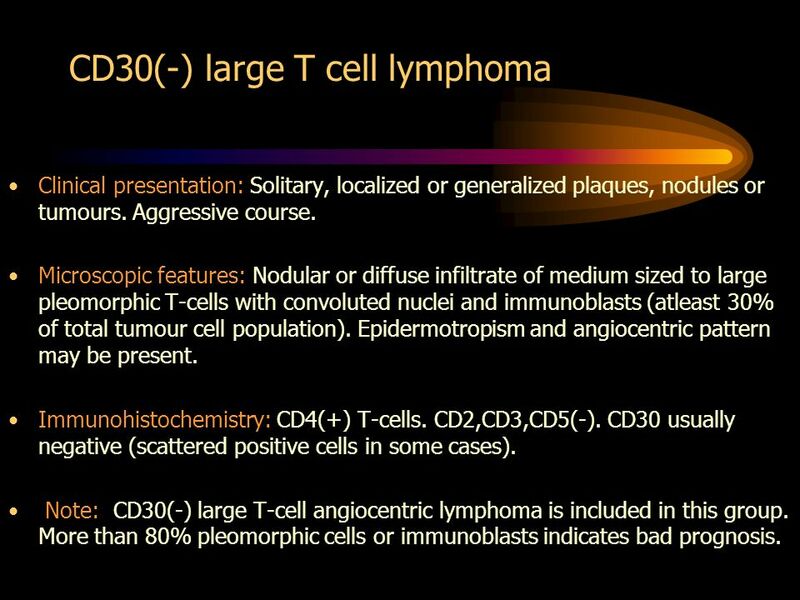 Note: CD30(-) large T-cell angiocentric lymphoma is included in this group. More than 80% pleomorphic cells or immunoblasts indicates bad prognosis. 17 Sezary syndrome Clinical presentation: Pruritic , erythroderma with circulating cerebriform cells. Lymphadenopathy,alopecia and palmoplantar hyperkeratosis are common. Microscopic features: Multiple sections are needed for making a diagnosis.Variable appearance. MF-like features in some cases. Band- like infiltrate composed of small lymphocytes together with some large cells with convoluted nuclei. Nonspecific features in one third of cases. Immunohistohemistry: CD3(+), CD4(+), CD8(-), CD30(-) Indication of bad prognosis: Visceral involvement ; older patients; sezary cells more than 5% of the total lymphocytes. 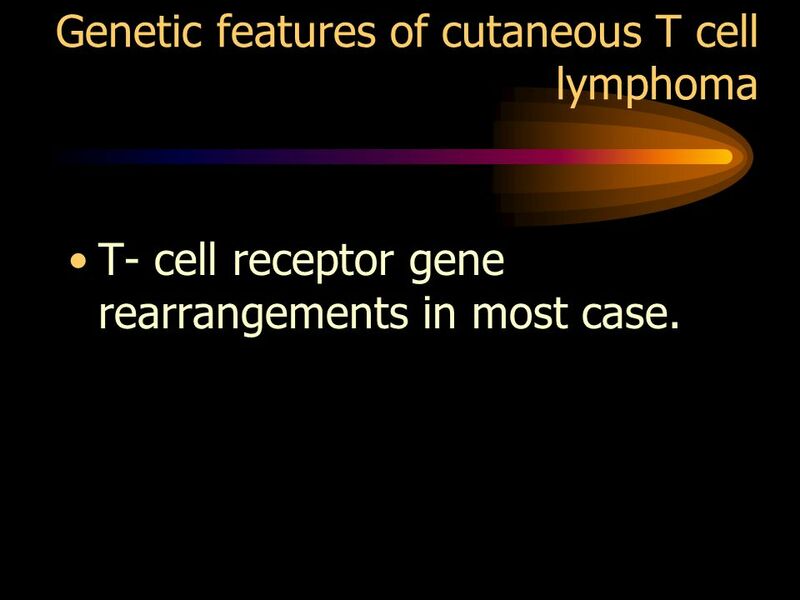 T- cell receptor gene rearrangements in most case. 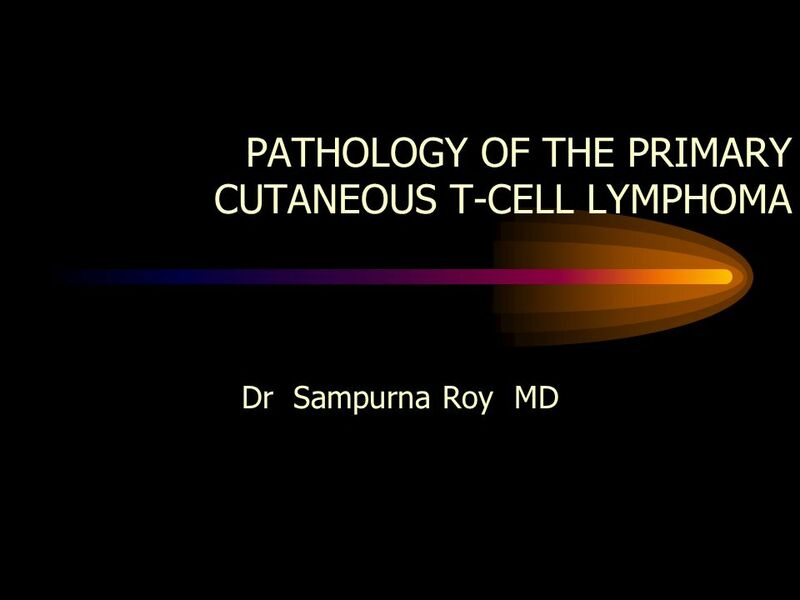 Download ppt "PATHOLOGY OF THE PRIMARY CUTANEOUS T-CELL LYMPHOMA"
HAEMATOLOGY MODULE: LYMPHOMA Adult Medical-Surgical Nursing. 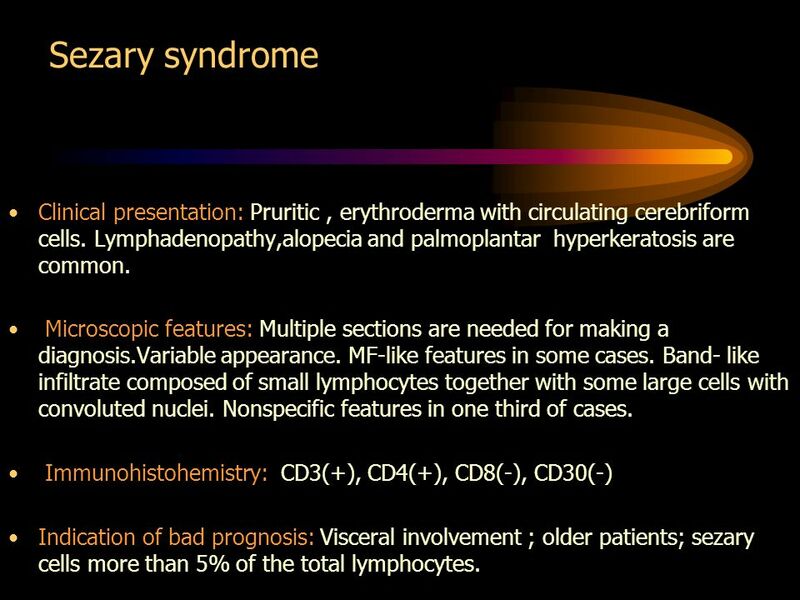 Lymphoid System Dr. Raid Jastania Dec, By the end of this session you should be able to: –Describe the components of the lymphoid system –List the. The lymphoreticular system is involved in the defence of the body against microorganisms and foreign substances – i.e. the immune response. Consists of. Cutaneous Lymphoid Hyperplasia, Cutaneous T-Cell Lymphoma, Other Malignant Lymphomas, and Allied Diseases Rick Lin, DO, MPH March 18, 2003. Primary Cutaneous Lymphoma Heterogeneous group of T and B-cell lymphomas variation in –clinical presentation –histology –immunophenotype –prognosis Incidence. 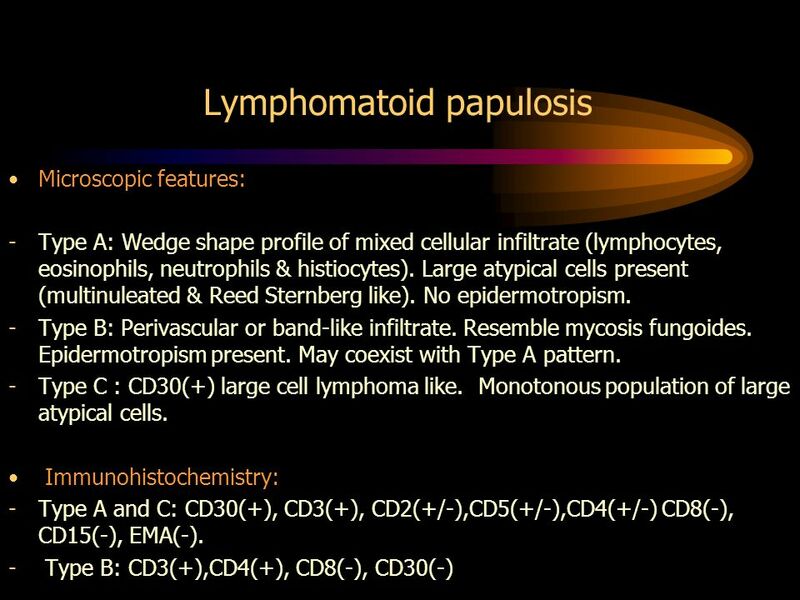 HODGKIN ’ S LYMPHOMA Introduction Lymphocyte Predominance Classical HL  Nodular Sclerosis  Mixed cellularity  Lymphocyte rich  Lymphocyte depletion.